COLORADO SPRINGS, Colo., Oct. 25, 2018 /Christian Newswire/ -- Biblica, the International Bible Society (www.biblica.com), is partnering with a multi-media urban ministry team to share the Bible’s unchanging, relevant truth in an innovative way. 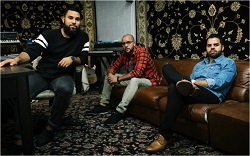 Photo: Biblica, the International Bible Society, has licensed its Nueva Version International translation for a Spanish-language, hip-hop-style audio Bible to be produced by Streetlights, the Chicago-based ministry led by (left to right) Aaron Lopez, Esteban Shedd and Loren La Luz. Biblica is pleased to bring its Spanish-language Nueva Version International (NVI) Bible to the partnership with Streetlights (www.streetightsbible.com), a Chicago-based ministry with a team of ministers, musicians, and artists focused on reaching youth and young adults with little exposure to the Bible. The alliance will result in a Spanish-language edition of the New Testament and Psalms in Streetlights' unique hip-hop style, due to begin releasing first components next year. It follows last year's commencement of the partnership with Biblica's New International Version for Streetlights' "I AM" short video series. That eight-part series combined voice-over of the NIV text with striking video imagery and a hip-hop soundtrack. The edgy, visual, bite-sized format—one of the evangelism resources being promoted by The Gospel Coalition—has proved popular with those who do not know much about the Bible, and those who have limited reading ability. "We are delighted to be part of this new, Spanish-language Streetlights initiative, because it reflects the heart of all that we do at Biblica," said Biblica CEO Geoff Morin. "We believe that when it is made accessible—whether that's the language, the format, or the style—God's Word is life-changing good news for everyone, everywhere." Among those who have used the Streetlights series successfully is Tommy Kyllonen, lead pastor of Crossover Church in Tampa, Fla., who has also recorded several hip-hop albums as artist Urban D. "We just have shorter attention spans, and so to be able to get the Word of God in different and unique ways through this resource is so effective," he said. The Streetlights partnership will have an impact far beyond just Spanish-speaking communities in the United States, said Esteban Fernandez, Biblica's Latin Ministry Director. "We are excited about its potential in reaching young people and young adults throughout Latin America," he said. "With illiteracy levels a challenge in some parts of the region, utilizing digital youth culture is a creative way to present the Bible in a format they are familiar with." Streetlights was formed by Esteban Shedd, with friends Loren La Luz and Aaron Lopez. The three first met through the Chicago music scene and their college education at Moody Bible Institute. Through their work with young people, they realized that traditional Bible study settings did not work for many, and that a different approach was desperately needed to engage young people in a way they could internalize for themselves. "Hip-hop culture is the main conduit of multimedia expression today," said Shedd. "It's a worldwide culture that has influenced all musical genres, all big cities, and the moment-by-moment education of young people around the globe. It flows into urban centers, the suburbs and rural communities alike. It's time for the church to authentically use the voice of native Christian communicators for Gospel proclamation—not abuse it, but use it to express the goodness of God in a diverse natural voice." Shedd said that the partnership with Biblica, a nonprofit, reflected not just shared vision but shared values. Streetlights makes all its materials available free because its target audience "isn't going to pay for the Word of God because that's not where their primary interest is, or they may not have the money," said Shedd. "That's why our partnership with Biblica is so huge," he added. "There's that like-minded mentality." The Streetlights partnership is just the latest example of Biblica's long-standing commitment to creative access to God's Word. It has ranged from an early braille edition and audio versions for the vision-impaired to digital content that can be accessed by people living in parts of the world where physical copies may not be available because of economic, geographic, religious, or political barriers. To learn more about the Biblica-Streetlights partnership go to www.biblica.com/streetlights. Streetlights (www.streetlightsbible.com) exists to translate, teach and proclaim God's Word through creative communication and innovative production, so that all people, regardless of educational background or knowledge of the Bible, can engage the Scriptures.